With my 9th graders, I’ve always done series and parallel circuits pretty superficially where they try a few things in the lab, then memorize a couple of key behaviors. This year, my students have been thinking about the energy in circuits in some interesting ways that seem useful for getting at Kirchoff’s Rules, so I decided to give it a go. 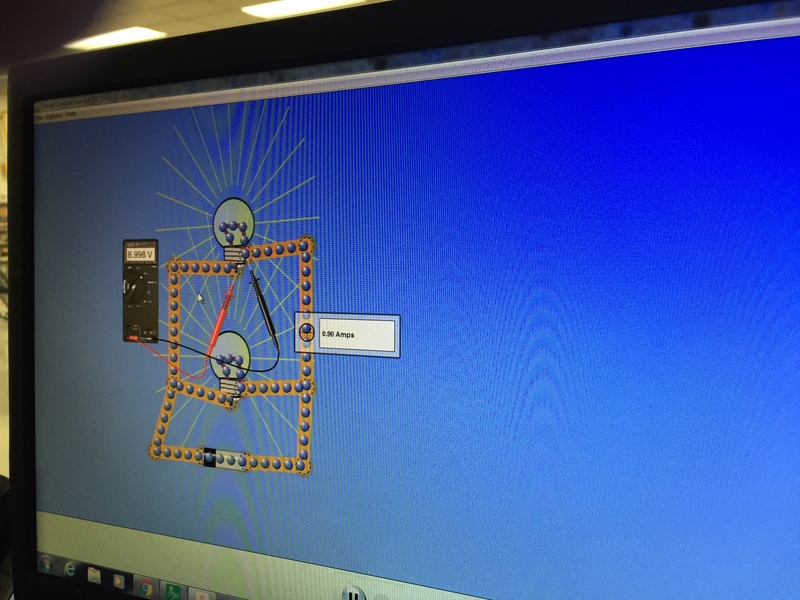 Today, students used PhET’s circuit kit to compare the voltage and current in different parts of each type of circuit. Students were able to articulate very nicely their own versions of Kirchoff’s Rules based on the energy in the circuit. Today, students took their first look at forces in 2D and drew some vector addition diagrams to scale. The problems, lifted from Kelly O’Shea, were all on a grid to keep things straightforward. This gave students the opportunity to practice drawing vector addition diagrams and start thinking about what they mean without getting bogged down in the math. Tomorrow, we’ll start crunching numbers with the diagrams.